PHOTO CREDIT: Smithsonian Institution / Hugh Talman. In 1961, a group of students at Howard University organized a debate between two influential voices on civil and human rights at the time, Malcolm X and Bayard Rustin. Fifty-six years later, there was a reenactment of that event, introducing the debate to a new generation. This staged reading of the debate took place in Washington, D.C. this month as part of the March on Washington Film Festival and was held in partnership with the Smithsonian National Museum of American History, the venue for the event. 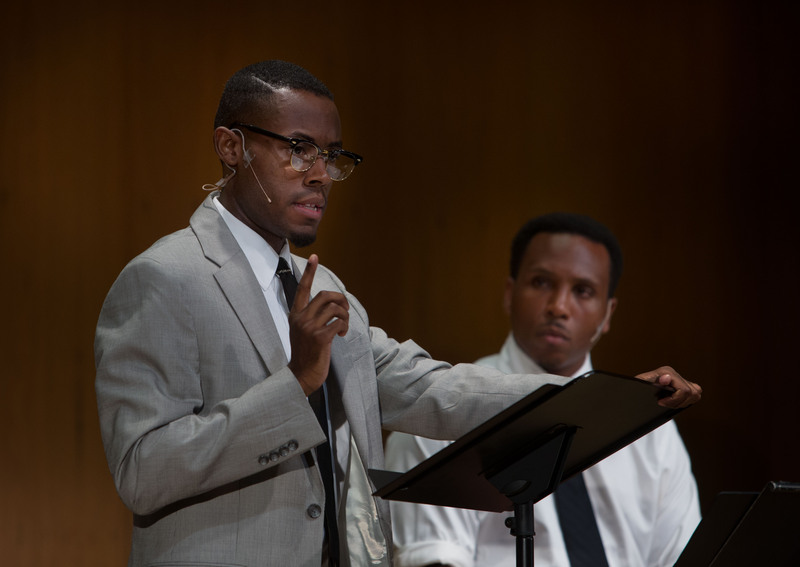 The new theater piece is called “Project Awareness,” and is written by Christopher W. Wilson, the director of the museum’s program in African-American history and culture. The reenactment is directed by Roberta Gasbarre from the Smithsonian Associates’ Discovery Theater. Gasbarre said in an interview with the Michigan Chronicle that though many years have passed, the debate is still relevant in today’s conversation on racial justice. “Project Awareness” is based on witness accounts from those at Howard’s Cramton Auditorium that day in 1961 and new research by the museum. The event happened three years before Malcolm X’s pilgrimage to Mecca and demonstrated his support for separation against Rustin’s advocacy for integration. The project examines how issues of race, political philosophy and religion are often intertwined. It details how James M. Nabrit Jr., the president of Howard at the time, was reluctant to allow the debate to happen but eventually agreed to it, and the power students have in sparking important conversations in society and creating change. An original photo from the 1961 debate between Bayard Rustin and Malcolm X. PHOTO CREDIT: AP / John Duricka. Courtland Cox, a student at Howard at the time of the debate, spoke to the audience at the festival event about his memories from watching the event unfold in that packed auditorium back in 1961. Among those watching the staged reading was Rachelle Horowitz, who worked with Rustin for years and was appointed by him to be the transportation coordinator for the 1963 March on Washington. Horowitz, who was 24 years old at the time, helped coordinate buses from cities across the nation to D.C. for the march. She told the Michigan Chronicle that she remembers working with students at Howard who were part of the Nonviolent Action Group, a campus organization fighting for civil rights that included students who planned the 1961 debate. She said that young activists today can learn from the planning and discipline behind protests in the civil rights era. Also in the audience during the reenactment was Dion Diamond, who, by his own count, was arrested approximately thirty times for his protests during the civil rights movement and was in a Mississippi prison at the time of the debate. Diamond told the Michigan Chronicle that his message to young millennials today is to never forget the past and think critically about what came before them. One of the attendees at the event, Sylvia Dove, who has been coming to the film festival for several years now, told the Michigan Chronicle that she knew little about the 1961 debate before watching the reenactment. It has left her inspired to go out and learn more about the civil rights movement. Horowitz said that it is important for young people to learn from history and ultimately use that knowledge to their advantage in their own fight to advance civil rights.